Proving children can be quite resourceful when they put their minds to it, one little boy has gone above and beyond to propose to his schoolyard crush. Taking his mum’s engagement ring, adorned with three large diamonds, Tommy made sure he was well-placed to get a yes from his little love Millie. Naturally Millie rushed home to tell her parents the good news. It could have been easily dismissed as cute play time but when Millie produced the very elaborate and obviously expensive ring from her schoolbag, her parents knew Tommy meant business. Still fighting laughter, Millie’s dad recounts the story in all its hilarity. Here is the full video posted to Facebook page The LAD Bible. 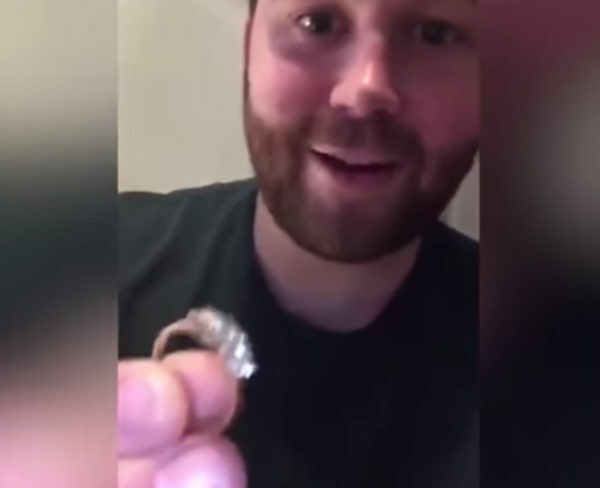 “So Tommy’s proposed to Millie and she keeps telling us she’s got a ring in her bag, so like anyone we was expecting the Haribo ring,” Millie’s dad explains before asking his daughter to go and get the ring Tommy gave her. Turns out, Tommy isn’t the first to have the idea to repurpose a ring belonging to a family member. We would love to hear stories of your little Casanovas.